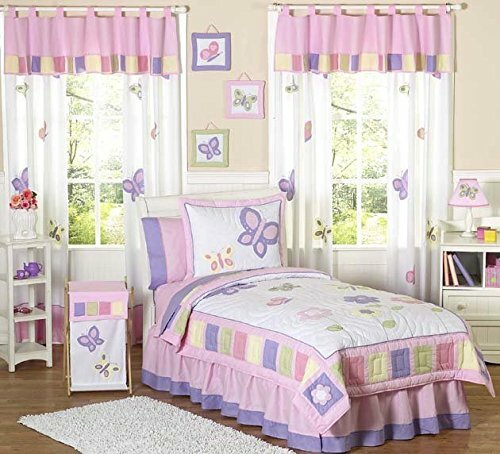 A butterfly themed bedroom is a popular theme for girls around the world and is sure to be enjoyed by your own little girl. There are so many ways of creating a butterfly bedroom which makes designing this bedroom a lot of fun. One of the things I love about having a butterfly theme is that you can use just about any color. My best friend’s daughter was crazy about pink when she had a butterfly bedroom so we combined the two to create a room she hated to leave when they moved……….until she was promised a princess bedroom, but that’s a whole different story! There are lots of things to consider when creating a girls bedroom and I usually start with the door, then move to the walls, floors and windows before looking at the main piece of furniture in the room – the bed. Today however I think we should look at the bed first. I recommend getting your daughter a plain white bed so that it can grow with her through all the different stages of her life. When it comes to butterfly bedding, well it appears the skies the limit so let’s check out what’s available to purchase online. This bedding set is in pink and purple which are often a girl’s favourite colors and it contains a comforter, a sham, a bed skirt and a window valance. 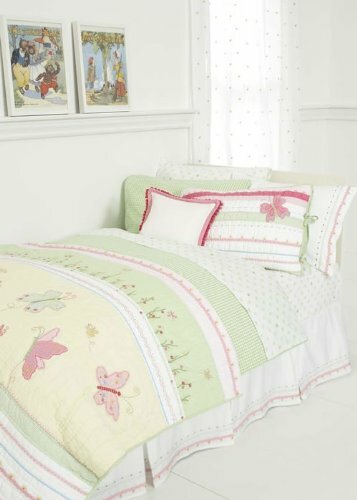 There is also a matching set of window panels which you can buy to compliment this bedding set and according to Amazon most people who buy this set also purchase these cute butterfly wall hangings with it. This quilt is very restful with hand embroidered butterflies appliqued onto the quilt. It’s a very understated way of adding butterflies into the bedroom which means that as your daughter grows up she won’t feel like her bedding is ‘too childish’ which is a good thing. This set of butterfly bedding contains a quilt and two shams in a homely design that feels warm as well as being covered in butterflies. This quilt nicely combines pinks, blues and green with a white background which means lots of options for decorating the bedroom walls. Once you’ve decided on which bedding you want to use it’s time to start pulling your beautiful butterfly bedroom together which means starting at the entrance to your butterfly garden – the bedroom door. Now if you’re a girl of a certain age then you’ll want a sign on your door and it really doesn’t matter if no other door in the house has a sign, your bedroom needs one! This wooden sign brought to you by Melissa & Doug is available in a number of different colors and comes complete with letter stickers ready for you to personalize it with your little girl’s name. Once you’ve decided on what bedding you want to use in your butterfly sanctuary then you can pick out one of the colors featured and use that on the walls. As I’ve previously said one of the best things about this style of bedroom is that you can use just about any color on the wall! A great way to add personality to the bedroom walls is by adding a little wall art whether you get a few posters hanging up (putting them in frames really makes them look great) or you go for a canvas print or even add some wall decals. Wall decals are a very trendy form of home decorating these days and can be used around your home, but I think they really come into their own when you’re creating a themed bedroom for a child as is the case with these gorgeous butterfly wall decals. 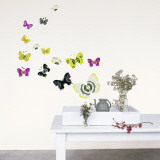 There are lots of different wall decals to choose from so if you want different color butterflies from blue to pink or anywhere in between click on the image to go to the AllPosters website where you can browse all of their gorgeous designs. I love to add a nice rug to my daughter’s bedroom, the carpet is always kept in neutral colors so a rug is a great way to add a touch of her favourite color or to add to the theme of the bedroom. In the case of butterflies there are lots of different rugs to choose from – here’s two to whet your appetite. I included some window panels above in one of the bedroom sets, but what I found was a really nice touch (and we used this in a friend’s daughter’s room) was to have a plain blind and then we had some plain sheer white panels on either side of the window that were tied back with some butterfly tie-backs which the little girl thought was ‘very posh – like the Queen.’ We’re not sure where she got that idea from, but we nodded and agreed because that must mean she really was a princess! Here are some butterfly tie backs available online and they come in a range of different colors so you can choose whatever color you like. The sheer window panels also come in lots of colors including hot pink (my daughter’s had these in the past) and purple so you can make your windows reflect your child’s favourite colors as well. 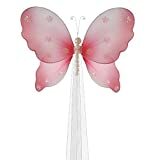 There are lots of butterfly room accessories that you can add to a girls butterfly bedroom and they include bedside lamps, alarm clocks, photo frames, jewelry boxes and more. Depending on your child's age you can also get them to make something of their own to add to their room as you can buy ceramic butterfly ornaments and piggy banks for children to decorate by themselves - a gift, craft activity and bedroom accessory all rolled into one! Another fun theme that we have in common. I love butterflies in nurseries and bedrooms for little girls. I've featured this page on my new Butterfly Baby Shower Ideas page. These bedroom ideas are stunning! Butterflies are so cheerful.